Pick your type of oil or grease stain - automotive oil, car door grease, cooking oil, butter or margarine - this technique can be used to remove the stains. As a way to get one step ahead and make the stain easier to remove, when any type of oily stain happens never rub or wipe it because that will push it deeper into the fibers of the fabric. Gently lift away any solid matter - like a pat of butter - with the edge of a dull knife or spoon. Next, sprinkle on some cornstarch, baby powder, baking soda or even use a piece of bread to absorb as much of the oil as possible. It usually takes about fifteen minutes for the powder to absorb the oil before you brush it away. These steps will make stain removal in the laundry room much easier. As soon as possible, head to the laundry room and pretreat the stain with a solvent-based spray or gel-like Zout or Shout or Spray 'n Wash. If you don't have a solvent-based stain remover, apply a heavy-duty liquid detergent like Tide, Wisk, or Persil directly to the stain and work it in by gently rubbing the fabric together with your fingers or use an old soft toothbrush. If you only have powdered detergent, make a paste with a bit of warm water and apply to the stain. Be patient and allow the stain remover to work on the stain for at least 15 to 30 minutes. This will allow the chemicals to break apart the oil molecules making them easier to flush out of the fabric fibers. After pretreatment, wash the garment as usual in the hottest water recommended for the fabric along with the recommended amount of detergent for a regular load of laundry. If the fabric is a synthetic like polyester that wouldn't normally be washed in hot water, stretch the pretreated stained area of the fabric over a bowl and pour a steady stream of hot water directly onto the stain and then wash in cold or warm water. Inspect the stained area of the garment before drying and repeat the treatment if necessary. Never place an oil-stained garment in a dryer, the high heat will make the oil even more difficult to remove. Repeat the cleaning steps if necessary. When that olive oil dribbles on your favorite dry clean only shirt or jacket, use a dull knife or edge of a credit card to lift away the solids. Blot away as much of the oily liquid as possible with a dry white paper towel, a slice of white bread or you can sprinkle the stain with cornstarch or talcum powder. If the oil stain is small, you may be able to remove it by spot treating with a dry cleaning solvent. A stain removal pen will not be effective in removing oil. As soon as possible, head to the dry cleaner and point out and identify the stain to your professional cleaner. 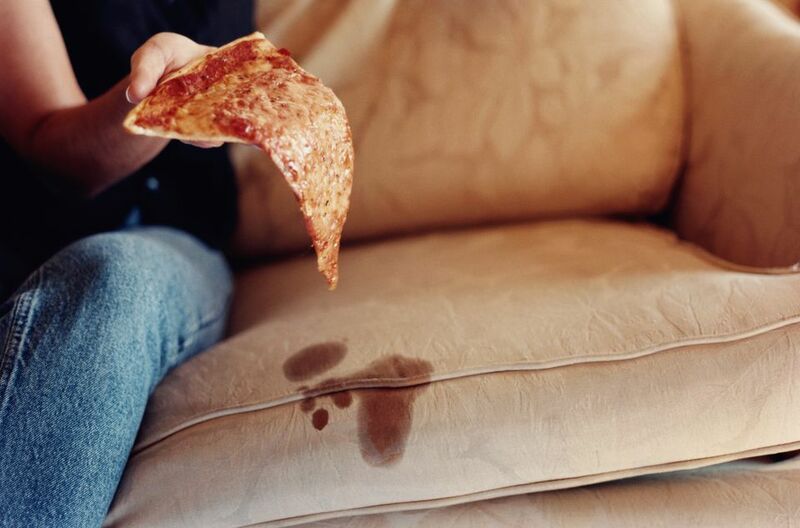 Whether the stain is splashed olive oil or oily dropped food, treat the stain promptly. It won't get any better on its own! Lift as much of any oily solids as possible away from the fibers using a dull knife. Do not rub because it will only push the oil deeper into the carpet and make the stain larger. Sprinkle the stain with cornstarch, baking soda or talcum powder to absorb the oil. Use a soft bristle brush to work the powder into the carpet. Allow the absorbing powder to sit on the stain for at least fifteen minutes. Next, vacuum to remove the powder. Following the product instructions, blot the stain with a dry cleaning solvent, Use a clean white cloth or paper towel. Keep blotting until no more oil is transferred from the carpet to the cloth. If you do not have a dry cleaning solvent or carpet cleaning product, mix one tablespoon of hand dishwashing detergent in two cups hot water. Add one tablespoon household ammonia. Blot the stain with a sponge or soft bristled brush dipped in the cleaning solution than with a dry paper towel until the stain is removed. Be sure to "rinse" the area with a cloth dipped in plain water to remove any soapy residue that will actually attract more soil. Repeat the cleaning steps until no more stain remains. The same cleaning techniques and products recommended for carpet can be used to remove butter stains from upholstery. If you use the wet cleaning steps, be careful not to over wet the fabric because excess moisture in the cushions can cause a problem. If the upholstery is silk or vintage, sprinkle with cornstarch and call a professional before attempting to remove the stain or if you need more stain removal tips.